We wanted to thank Jim Farrell, Aquatic Director and Nina Milinazzo, Gymnastics Director of the Newport County YMCA for coming out to Hodges this month to train us on the YMCA swim and gymnastics events. We got a lot of information in two days that will help us to help our customers. These two days of training are part of an ongoing program that includes every department from customer service to shipping. The program is to teach Hodges’ employees about the events that give out awards. It’s a win win situation. As customers, you benefit by knowledgeable employees. As employees, we can find job satisfaction in knowing we can do the best job possible and find motivation in the achievements that our products acknowledge. I know that may sound a little cliché but the fact of the matter is that we want to be the best awards company for both you and ourselves. If you have any ideas on types events we should be learning about please send them to us! So you’ve won some ribbons. Ok, so maybe you’ve won more than “some” ribbons. The problem is now you don’t know what to do with them. These ribbons are a treasured symbol of all the hard work you’ve put in and rightly so, you want to show them off! How do you do that? This a question we hear all of the time from our customers. We’ve come up with some great ideas over the years. Feel free to send us your own, we would love to hear them and pass them on! 2. A piece of old wooden fence – nice and weathered, provides a neutral background for rosettes to stand out against. Tack each ribbon to the wood. This is a great idea if you have several children that will continue to compete. As they win more and more ribbons you can look at building a small length of “fence” against a wall in the house and label off sections for each child. 3. Hang a piece of wire from corner to corner of a room and hang them for all to see. It become a virtual “border” of ribbon. 4. Have several strips of leather or belts from a decorative curtain rod and attach the ribbons going down the strip. You can always add to it when you need more space. Hang above the head board of a bed or just against the wall. 5. Hang a horseshoe with a strip of leather or belt hanging from it and attach ribbons down the strip. 6. Make a display board out of two layers of foam core covered with cloth. Hang up the ribbons on the board with clear push pins or stick pins. If you want something really big go to a hardware store and cover a piece of hard foam insulation with fabric. Black velveteen for the cloth with look “high end” and holds a lot of ribbons. 8. Look for a used kick board or boogie board, cover it with fabric and display the ribbons with cute tacks. As a company, we pride ourselves on providing fantastic customer service. We also realize how important it is to understand our customer’s needs. 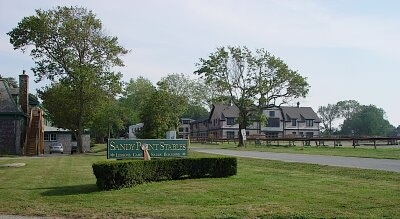 With this in mind, our customer service representatives, along with our Sales and Marketing staff, attended a local Hunter and Equitation show on August 20th at Sandy Point Stables in Portsmouth. Since Sandy Point is less than two miles from our Portsmouth office, this rare mid-week show allowed for groups to attend for a short time in the morning and afternoon and still get our work done in the office. While there, we got to see a variety of classes on the flat and over fences. As an equestrienne, I accompanied both groups to help explain what they saw, whether it was the type of class, how it was being judged, what type of fences were being jumped, etc. More importantly, I tried to tie in what they saw to how a customer putting on this show might order based on their prize list. One of our employees actually had a niece competing in the show that day so we were lucky enough to get up close with her horse so I could explain the various pieces of tack and equipment and what their use and purpose was. Since we also deal with a variety of markets on a daily basis, our reps have also received training sessions for dog shows and have upcoming meetings for gymnastics and swim as well. It’s your last chance to get your photographs in for the 2009 Equestrian Catalog Cover Contest! Deadline is November 1, 2008. To Enter, submit by mail a color photograph attached to an official entry form. The official rules are on the form. You can enter as many times as you’d like but each entry has to be accompanied by an entry form. Grand Prize – $2500 plus photograph appears on the cover of Hodge’s Badge Company’s 2009 Equestrian Awards Catalog. Check out ALL of last year’s Winners here! Hurry! Entries must be postmarked on or before November 1, 2008! Last month four of us at Hodges’ traveled up to Burlington, Vermont for the New England Mail Order Association (NEMOA) 2008 Fall Conference. This a great group for small mailers to learn from and network with. It was also the perfect place for a conference dedicated to “Growing Green” – Business and environmental sustainability in today’s market… Burlington was beautiful, and with the hotel right across from Lake Champlain you woke to an awesome view where the leaves were just starting to turn. It was a great conference. The goal was to introduce members to other catalogers who have a “Green” program going and show us what they are doing to make it work. We learned a lot in 3 days and met some interesting people from all kinds of catalog companies. The conference started with a panel of catalogers, Brian McGovern from Timberland, David Hay from Plow & Hearthand Nancy Fischman from L.L.Bean showing us what they do and what we can do. They definitely have a grasp on what can be done and why it’s important. It was impressive. At Hodges we are already trying to get the message out that we are starting to go green and it’s important to be environmentally conscious. We are spreading the word that our ribbon products are biodegradable and our catalogs are printed at a certified environmentally friendly printer now. It’s a small start but this conference gave us more ideas. We are even starting a “green team” to look around the company for places were green improvements can be made as well.